For 2017, the 4Runner is carried over with minimal changes. The Trail and Trail Premium are renamed TRD Off-Road and TRD Off-Road Premium, and the TRD Pro Series is available in three additional colors. The 2017 Toyota 4Runner is available in six trim levels: SR5, SR5 Premium, TRD Off-Road, TRD Off-Road Premium, TRD Pro and Limited. All share the same 4.0-liter V6 (270 horsepower, 278 pound-feet of torque) and five-speed automatic transmission and are rated to tow up to 5,000 pounds. SR5 and Limited models are available in 4x2 or 4x4 configurations and offer third-row seating (for seven occupants) as an option. The remaining trim levels are 4x4 only and seat five. A low-range transfer case comes on 4x4 versions of the SR5, TRD Off-Road and TRD Pro trim levels. The SR5 is the base model but it's not bare-bones. Standard features include cloth upholstery, skid plates, foglights, a backup camera, keyless entry, five 12-volt power outlets and a 120-volt AC power outlet. 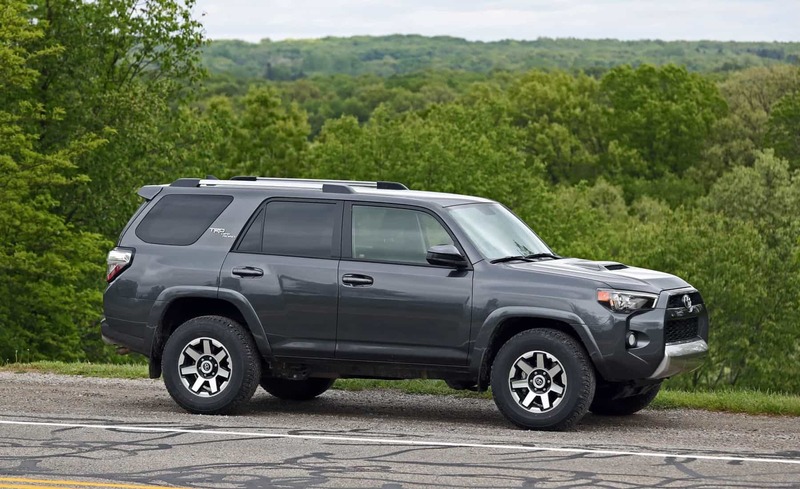 Stepping up to TRD Off-Road adds some serious off-road chops in the form of a locking rear differential, wheels that are 0.5 inch wider and a crawl control function. It also offers the optional KDSS suspension. Premium variants of the SR5 and TRD Off-Road get power-adjustable and heated outside mirrors, premium vinyl upholstery, navigation and an auto-dimming rearview mirror. Serious off-roaders should consider the TRD Pro, which starts with the TRD Off-Road Premium and adds revised front springs, Bilstein dampers with rear remote reservoirs, Nitto Terra Grappler tires and a front skid plate. Limited models top the 4Runner range. These models get a Torsen center differential (4x4 models only) plus a host of features to make it better suited to on-pavement use: 20-inch wheels, a sunroof, dual-zone climate control, parking alerts, perforated leather seat upholstery, a 15-speaker premium audio system. Power running boards are optional.